Everything from orange popsicles to gelatins to hard candies can give your tongue a very distinct, warm hue, but what if your tongue has changed colors and you haven’t eaten any of these foods? Should you be concerned? According to your family dentist in Toledo, there are numerous factors that can cause the tongue to turn orange, and some may actually indicate an underlying medical condition. What are they? Read on to learn more. Just like your teeth and gums, food debris and bacteria can accumulate on your tongue if you don’t regularly brush. Items like coffee and tobacco in particular can cause the tongue to appear orange if the mouth isn’t consistently cleaned. Severe dry mouth, known as xerostomia, is a very common side effect of some medications, and this can lead to a buildup of bacteria in the mouth that eventually changes the color of the tongue. Left alone, this bacteria can lead to oral decay as well. This is an oral yeast infection that occurs when too much of the fungi Candida is allowed to collect on the tongue, causing it to appear yellow or orange. Oral thrush can be found in patients of all ages, particularly those who take steroid medications or who have weakened immune systems. Even infants can develop oral thrush if they are on antibiotics. Beta carotene is what gives foods like carrots and oranges their distinct color. Eating enough foods that are rich in beta carotene can cause the tongue and even the skin to turn orange, which is a condition called carotenemia. It is most commonly found in infants and young children who consume a lot of mashed carrots. Fortunately, while off-putting, carotenemia is harmless, and it should go away if a person simply eats less beta carotene-rich foods. If your tongue is turning orange for any reason, your first course of action should be to double-down on your oral hygiene routine. In addition to brushing and flossing, you should also integrate the use of a tongue scraper to remove any food debris and bacteria. This will have the added bonus of making your breath nice and fresh! However, if this doesn’t seem to help, you should contact your dentist in Toledo. They’ll give you a brief exam and ask you about your daily habits so they can determine what is actually causing your orange tongue. If it’s a lack of oral hygiene or thrush, they’ll be able to help you right in the office. But, if your orange tongue is due to dry mouth because of medications you’re taking, they’ll refer you to your family doctor. 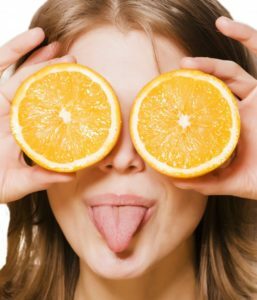 In short, while an orange tongue is usually nothing to be concerned about, be sure to contact your dentist if one persists, and maybe cut back on the orange foods for good measure! Dr. Richard Thomas is a family dentist based in Toledo who currently practices at Dental Group West. There, he and his team provide comprehensive dental care for patients of all ages so they can achieve the strong, healthy, and beautiful smiles they desire. If you’re concerned about an orange tongue or any other lingering oral health issue, his team is ready to help, so contact him today.